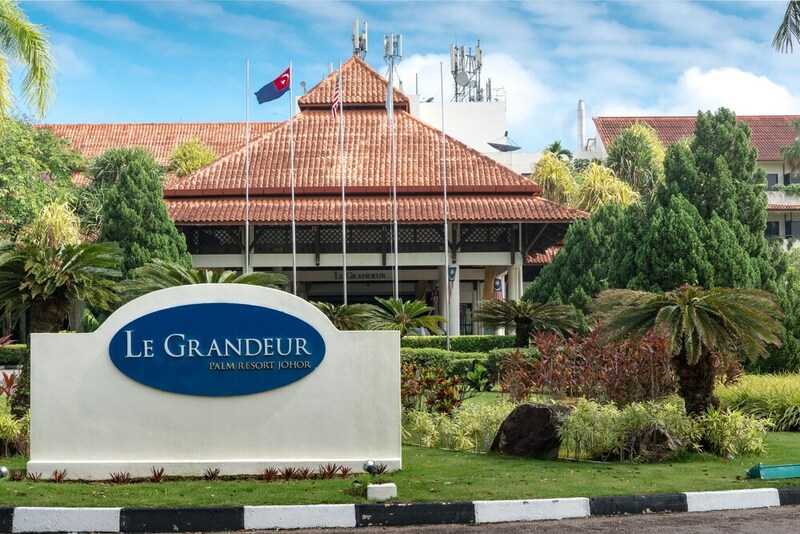 Le Grandeur Palm Resort Johor lies beside 3 golf courses and is a 3-minute drive from Senai International Airport. Johor Bahru's city center is about a 30-minute drive from this 4-star property. Guests enjoy a freeform outdoor pool with a swim-up bar, a sports and leisure center with 4 tennis courts and a bowling alley, and a gym. Also offered are 4 restaurants and a full-service spa. All of the hotel's 330 accommodations open to balconies with views of the golf course, pool, or tropical gardens. Rooms are equipped with air conditioning and complimentary wireless Internet access. The 4-star Le Grandeur Palm Resort Johor, located alongside 3 championship golf courses, is a relaxing oasis for the business or leisure traveler. The hotel features a freeform outdoor pool with a swim-up bar, a gym with a spa tub and sauna, and the in-house Le Spa. Guests can also enjoy the Sport & Leisure Center, which includes a large lap pool, 4 tennis courts, and an 8-lane bowling alley. The hotel offers a shuttle to shopping and nearby areas for a surcharge. Dining options at the hotel include The Grill at Cocomo and a buffet-style brasserie overlooking the pool. Also featured are Japanese and Chinese restaurants, and a bar featuring live entertainment. A buffet breakfast (surcharge) and limited room service are available. This Senai hotel has a 24-hour business center, and public areas are equipped with complimentary wireless Internet access. An airport shuttle can be arranged (advance reservations required), and the hotel provides laundry facilities as well as free parking. In addition to the following restaurants, Le Grandeur Palm Resort offers a poolside lounge serving drinks and snacks. The Bar features live entertainment, drinks, and light fare. For a surcharge, a buffet breakfast is served daily in the brasserie. Limited room service is available. Ishwara Asian Brasserie & Terrace - Rustic yet elegant, this garden restaurant overlooks the pool and offers both a buffet and an à la carte menu. Reservations are recommended. Open for breakfast, lunch, and dinner. Some meals may not be served daily. Sobasei - A sushi bar, teppanyaki grills, and tatami rooms are featured at this authentic Japanese restaurant. Reservations are recommended. Open for lunch and dinner. Xin-Shan Long - This Chinese restaurant serves traditional dishes as well as innovative Asian fusion. Reservations are recommended. Open for lunch and dinner. The Grill at Cocomo - Guests can enjoy succulent steaks and other barbecued delights at this thatched-roof restaurant overlooking the pool. Both buffets and fine dining are available. Open for dinner only. In addition to the golf courses within a short walk, the hotel features a freeform outdoor pool, and a gym with a spa tub and sauna. The Sport & Leisure Center has a 50-meter lap pool, 4 tennis courts, and an open lawn court. Indoor facilities at the center include an 8-lane bowling alley, squash courts, billiards/snooker, and darts. Children enjoy a playground. The full-service Le Spa is set amid landscaped tropical gardens. Four treatment rooms include rooms for couples. Services include massages, facials, and body scrubs, as well as manicures, pedicures, and aromatherapy.